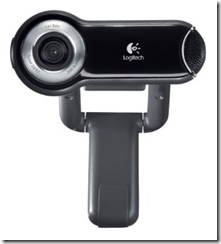 Amazon has the Logitech Webcam Pro 9000 at an incredible price – $49.99 after rebate. This excellent webcam usually sells for $69.99 but you can get a $20 mail-in-rebate and get this webcam at $49.99. Logitech Webcam Pro 9000 offers easy setup and exceptional HD video recording for your desktop of laptop. Plus, did you see how elegant it looks too?